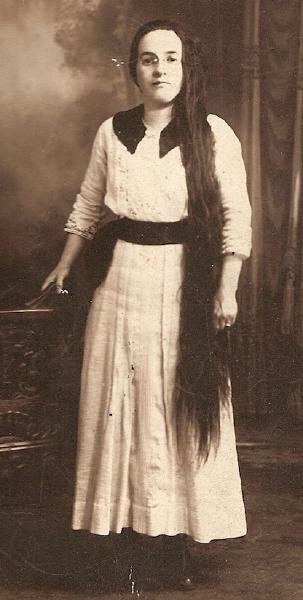 Hannah Heath Wilson was born on 3 July 1885 in Buffalo, Erie County, New York, or possibly in 1886. William Simpson Wilson and Kate DeYoung appeared in the New York state census of 16 February 1892 in Buffalo, New York. Other members of the household included Hannah Heath Wilson, Ida Jeanette Wilson, Margaret Blanche Wilson, Grace M. Wilson, William Edward Wilson, Kate R. Wilson and Charles A. Wilson. William Simpson Wilson and Kate DeYoung appeared in the US federal census of 1 June 1900 in Buffalo, Erie County, New York, at 30 Maywood. Other members of the household included Hannah Heath Wilson, Ida Jeanette Wilson, Grace M. Wilson, William Edward Wilson, Kate R. Wilson, Charles A. Wilson, Herbert Longsdale Wilson and Harriet C. Wilson. Daughter Grace also is enumerated in the household of her sister Margaret Devine. The following appeared on 9 November 1906 in The Simcoe Reformer: (Walsingham Center) Miss Hannah Wilson returns to Buffalo on Monday, after spending two or three weeks with her parents. She married Edwin Eugene Brown, son of Reuben Brown and Louisa Weatherbee, circa 1907 in Simcoe, Ontario, Canada. In August 1917, Hannah Heath Wilson was living in Hamilton, Ontario, Canada, at time of brother Charles A. obituary. In 30 January 1941, Hannah Heath Wilson was living in Toronto, York County, Ontario, Canada, at time of mother's death notice. Hannah Heath Wilson became a widow at the 5 March 1949 death of her husband Edwin Eugene Brown. Hannah Heath Wilson died on 6 February 1971 at age 85 in York County, Ontario, Canada, at Martin Manor Nursing Home. She was interred at Westminster Cemetery, North York, York County, Ontario, Canada. The following appeared on 8 February 1971 in the Toronto Daily Star: [Died] At the Nursing Home in Newmarket, on Saturday, February 4, 1971, Hannah Wilson, beloved wife of the late Edwin E. Brown of Toronto, dear mother of Adeline (Mrs. Harry Miller), and Earl, also survived by five grandchildren and 12 great-grandchilcren. Resting at the Marshall Funeral Home, 125 Yonge St. North, Richmond Hill. Service Monday 1:30 p.m. Interment Westminster Cemetery.